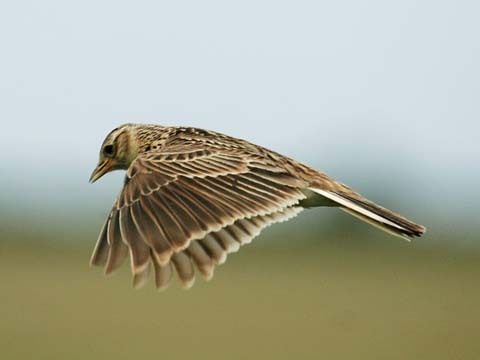 The skylark was unable to resist. And she had, after all, so many feathers. So, with the swift motion she pulled out a feather – just a small one – from beneath her wing and gave it to the merchant. “Take your pick, my little friend…any two, your heart’s desire!” The skylark quickly snatched up two of the plumpest worms and swallowed her meal with delight. Never before had she tasted such wonderful worms. With a loud chirp, she leapt into the air and resumed her joyful flight. Day after day the skylark returned. And always the merchant had wonderful worms to offer: black ones and blue ones, red ones and green one, all fat and shiny and iridescent. But one day, after eating her fill, the skylark leapt again into the air – and to her horror, she fell to the ground with a thud. She was unable to fly! All at once with a shock she realized what had happened. From eating the delicious worms she had grown fatter and fatter; and she had plucked her feathers one by one, first her body, then her tail, and finally her very wings had grown balder and balder. Horrified, she remembered how slowly, imperceptibly, day by day, it had been getting harder and harder to fly, and how she had told herself it was no matter. She could always stop before it was too late. Now suddenly, here she was, trapped on the ground. She looked up and saw the merchant looking at her. Was that a small, sly grin spreading across his face? He grabbed the now helpless bird, put her in a cage, and walked away laughing. Followers of Jesus were meant to “fly”…to let the winds of the Spirit lead them to where they can love, serve and glorify God with their very lives. To “cage” a Christ-follower by keeping them “well fed” even if it is within the confines of church is to rob them of their created purpose and identity in Jesus. What is our intention in discipling those whom Jesus loved and empowered through His Spirit? Is it to keep them pump and flightless or to enable them to be follow the Spirit on a spiritual quest that embodies the very dream of God? I think you what the Lord would be saying about that! There is a good reason for us to be in spiritual community…but never is it to get those God intended to fly all plump and flightless! ← Moments? What are they?